The Cutera CoolGlide laser machine was the first cosmetic laser system to be cleared by the FDA for permanent hair reduction on all skin types, and it remains one of the most popular models in the industry. 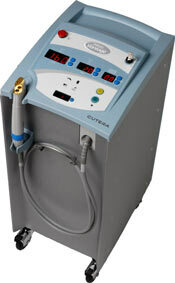 It features Cutera’s exclusive PowerFlex technology that helps you treat patients faster and more efficiently. Dimensions: 13? x 18? x 32? To achieve maximum patient comfort, the Cutera CoolGlide system offers a copper cooling system and the ability to treat all skin types, including tanned skin. You simply will not find a more effective and affordable laser hair removal machine. If you are looking for the lowest price on a used Cutera CoolGlide laser system, all you need to do is fill out the form below and we’ll provide a fast price quote with no obligation. We are also available to answer any questions you might have or to help you compare cosmetic laser models and prices.